Along 35th Ave NE at about NE 107th Street, the road has been closed since June for a major flood control project. The two main branches of Thornton Creek, North and South, converge at that point, with Meadowbrook Pond as a flood control area just east of 35th Ave NE. 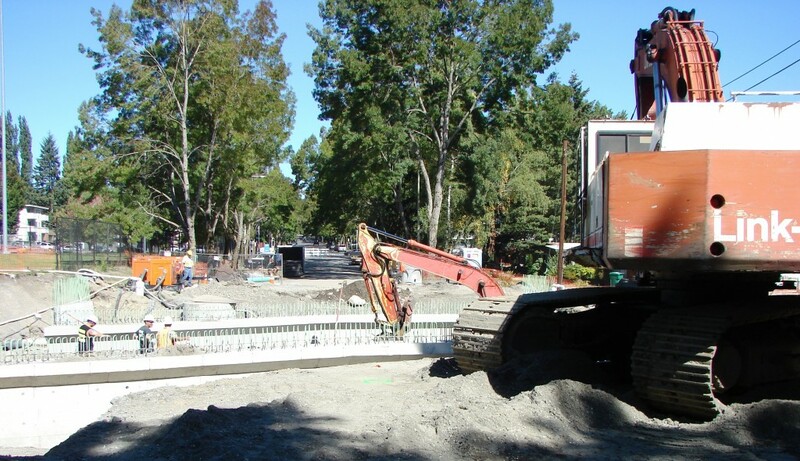 Digging for much larger culverts is still on-going, and for this reason 35th Ave NE will remain closed through the month of November. When finished, there will be wider sidewalks at that point along 35th Ave NE with overlooks of the creek on either side of the road. Work continues seven days per week on 35th Ave NE at the point of the road closure, NE 107th Street. Much larger culverts are being put in to carry the South Branch of Thornton Creek under the road and into Meadowbrook Pond on the eastern side of 35th. On either side of 35th Ave NE at NE 107th Street, the creekbeds are being enlarged and stabilized with logjams and rock weirs. On the east side of 35th Ave NE a floodplain is being created to handle sudden large flashes of water which can occur with heavy rainstorms. In past years, water has risen over the road, into adjacent houses, and over the parking lot of Nathan Hale High School. This is the third year of improvements to greatly increase the capacity for water in and around Meadowbrook Pond. 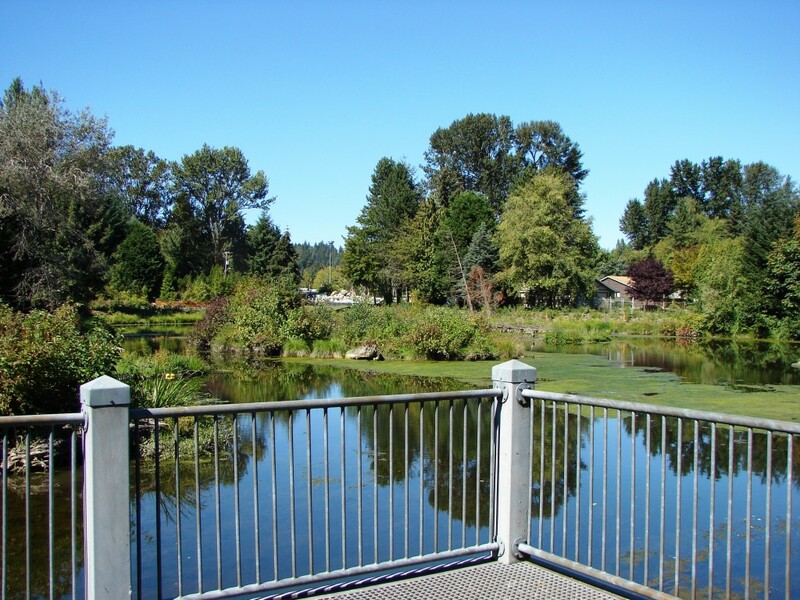 Meadowbrook Pond is on the east side of 35th Ave NE at NE 107th Street. In other projects, Meadowbrook has engaged SDOT’s Safe Routes to School program on NE 110th Street to complete the sidewalks near John Rogers Elementary School. 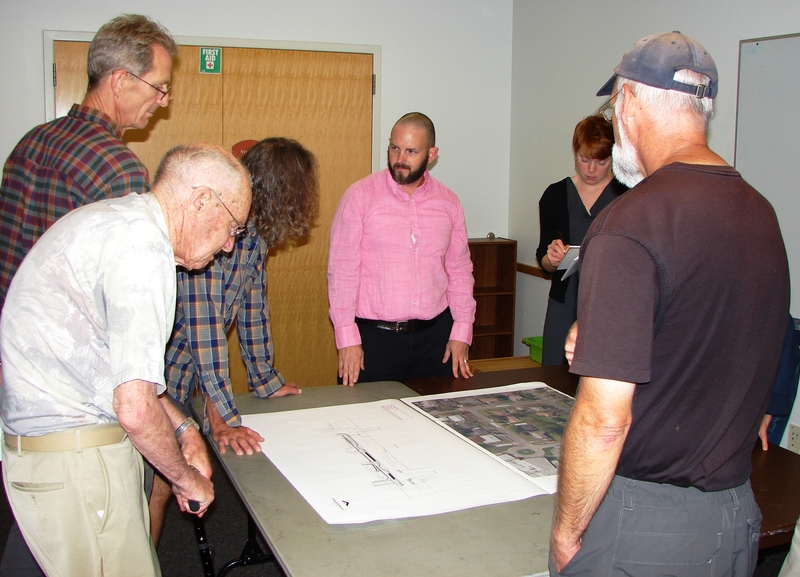 At the Meadowbrook Community Council meeting on September 9, neighbors looked at plans for the “missing link,” where a concrete sidewalk is to be installed. At the Meadowbrook Community Council meeting on September 9, 2014, Brian Doughtery of SDOT's Safe Routes to School answered questions about sidewalk plans for NE 110th Street.